Henderson, NV, February 07, 2018 –(PR.com)– Having been a performer and retailer for years now, Will Roya, the owner of PlayingCardDecks.com in Henderson, Nevada has launched a new Kickstarter campaign for what can only be described as the legendary side of playing cards. Instead of royalty, you get to see monsters, creatures, and mythical beings that usually only appear in books, films and nightmares. 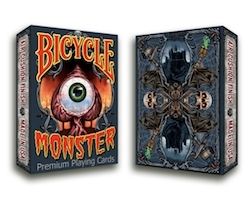 This deck will be released under the Bicycle Playing Cards brand. NextAre You Ready To BUMPA?